It was October 1998. I was sitting in my local masjid when an elderly Tunisian man dressed in a long brown thawb with a North African hat approached me and began conversing with me. He had a long, well-groomed beard which was greyer than his years and a beautiful fragrance of very sweet musk emanated from his clothes. He introduced himself as Hātim and after inquiring about myself, he asked me the above questions. I replied that I had never been on Ḥajj or even Umrah. I was a bit taken aback by the questions. Everyone I knew who had performed Ḥajj was quite elderly and pious. I was only 18, in my first year at university, and had only just begun praying five times a day. I had years before I would be making that journey. Hātim corrected me and advised me that it was imperative that I visit Allāh’s House as soon as possible as it would form the blueprint for the rest of my life and for my hereafter. Our encounter was a brief one and Hātim’s advice was concise. It remained in my thoughts however and the idea of performing Ḥajj regularly played in my mind. That evening, I made my intention to perform Ḥajj the following year. It never happened that year or the year after. For how could I visit anyone’s house without an invitation, let alone the house of my Lord? Finally, this year, the Most Merciful invited me to visit His house. The entire journey from beginning to end is like a dress rehearsal for the final journey we will all make to Allāh. In the weeks preceding my departure, like all ḥujjāj, I began calling and emailing family and friends, acquaintances and enemies, asking them all for their forgiveness for any hurt or offence I had ever caused them. Before leaving to seek my Lord’s forgiveness, it was essential that my slate was clean with all of His slaves. The final days involved ensuring any items I had borrowed from others were returned to them, that my debts, large and small, were cleared and that my bills were all paid. Finally, I began writing my will in case Allāh decided to take my soul at any stage of the journey. These repeated reminders of death were enough to place me in the correct frame of mind, not just for Ḥajj but for life – if this was the preparation for a 3 week trip, what should I be doing to prepare for my final journey, one whose departure date could be at any second? Even the ritual of donning the iḥrām clothing is a form of mentally preparing yourself for death. Like the dead person who is bathed and perfumed before burial, we too had to take a full bath, clip our fingernails and toenails, shave the hair from the underarm and pubic areas, apply perfume to our bodies and then dress ourselves in 2 pieces of plain unstitched white cloth, symbolic of the shrouds we will all be put in before burial. Like the dead, we too were leaving our families, our possession, and all our luxuries behind us on this journey. The iḥrām is one of Allāh’s ways of demolishing all concepts of racism, nationalism, and tribalism. Every year, Allāh causes the Muslims to come together and exhibit their unity to the world. From every village in every continent, from every nation on earth, from all walks of life, rich and poor, kings and peasants, healthy and disabled, black, white, brown and orange, they gather together dressed in the same two unstitched pieces of cloth. They have travelled here by plane, ship, bus and camel, chanting the same talbiyah, labbayk allāhumma labbayk, to answer the call of Ibrāhīm (ʿalayhi al-Salām). No divisions, no classes, but only unity. Ibrāhīm (ʿalayhi al-Salām), as was his habit, did not ask futile questions but obeyed the command of His Lord and put his complete trust in Him, the phenomenal results of which the world witnesses every year. The iḥrām is also a means of demonstrating the discipline which Islām instils within the believers; discipline which shows our obedience to our Lord. Purely for the sake of Allāh, the pilgrims make ḥarām upon themselves what would normally be ḥalāl – wearing perfume, using toothpaste or scented soap, covering their heads, touching their spouses – all to gain the pleasure of the One who created us. Even to argue while in iḥrām is to risk invalidating one’s Ḥajj; and when on an intense journey involving great hardship alongside people from all walks of life the opportunities for bickering are rife. Yet, most exercise amazing Ṣabr, all for the sake of their Lord. Nothing can prepare you for seeing the Kʿabah. When one considers the fact that this is the location of the first place on earth built for the worship of Allāh and that millions still visit it for that same purpose thousands of years later, one cannot help but be overwhelmed by its significance. This is the object towards which I have prayed since I was a child and to which 1.5 billion Muslims direct their worship five times a day. This is the image that I have seen in wall-frames, on prayer mats and on the television all my life. And now here I am, before it in all its glory, with a sea of Believers circumambulating it, engrossed in prayer and supplication. Nothing can prepare you for this moment – it is truly awe-inspiring. Following Ṭawāf, we perform the Sʿaī, the running between the hills of Safa and Marwa, following in the footsteps of Hājar (ʿalayha al-Salām) who ran frantically in the roasting desert sun, searching for water for her thirsty baby before Allāh sent Jibreel (ʿalayhi al-Salām) to dig the well of Zam-Zam. From this incident, we learn that circumstances will arise where nobody will be able to help us and we must put our full trust and faith in Allāh. Allāh will help us according to our sincerity and the level of hope and faith we have in Him. Hājar (ʿalayha al-Salām) is our example in this regard and her sincerity is evidenced by the fact that pilgrims continue to quench their thirst with the water of Zam-Zam all these years later. Arafat is the essence of Ḥajj as the Prophet (sall Allāhu ʿalayhi wa sallam) said that the Ḥajj is ʿArafah. It is the best day of the year. Allāh does not free more of his slaves from the Fire than He does on this day. It is for this reason that it is the most hated day of the year for Shayṭān. On no other day does Shayṭān feel as belittled, humiliated and angry as he does on the Day of ʿArafah. It is the day on which millions of Muslims from all parts of the globe gather together and beseech Allāh’s mercy and forgiveness. It is a day in which Allāh descends to the nearest heaven and expresses His pride to His angels about the people of ʿArafah saying “Look at My slaves. They have come from far and near, with hair dishevelled and faces covered with dust, to seek My mercy, even though they have not seen my chastisement.” It is a day that I will never forget. The name ʿArafah is derived from the Arabic root ʿarafa meaning ‘to get to know something or someone’. Allāh tells us in the Qur’ān that He wiped the back of Adam (ʿalayhi al-Salām), extracting all of his progeny like atoms and spread them across a plain and asked them, “Am I not your Lord?” to which all of creation responded “Yes. We bear witness”. This was so that on the Day of Resurrection, none of us can argue that we were heedless of this fact. This was the original covenant we all made with Allāh and it is the fitrah or natural disposition within every human being, an innate acknowledgment of Allāh as the Creator, the Planner and the Provider. Many scholars have concluded that this covenant took place on the plain of ʿArafah. It was in this place that Allāh made Himself known to mankind and in which He planted the fitrah in them. In returning to ʿArafah now we are retaking this covenant and this pledge to Allāh. From my position on the ground, it was very difficult to appreciate the magnitude of the event, which one could only do by seeing the television footage and images of millions of pilgrims standing in prayer. But what those aerial images do not capture is the spirit of the moment. On the Jabal al-Rahma, on the streets, in and around the tents, pilgrims stood for hours with their hands raised to the sky pleading to their Creator for forgiveness and to be given a second chance at life. The atmosphere was filled with peace and serenity – everyone here was present for no other reason than to beg their Lord for forgiveness. All had sustained severe difficulty and hardship for these precious few hours and exerted themselves in their worship to their maximum ability. Their lengthy standing, their sincere heartfelt supplications and their unstoppable tears all pointed towards the yaqīn or certainty they had that Allāh (subḥānahu wa taʿālā) was there listening to them and responding to them. For me, I have never felt as close to Allāh as I did in that last hour before sunset; it was as though I was engaged in a one-to-one conversation with Him and He was accepting and responding to everything I said. I felt like a child confessing everything to his parent, begging for forgiveness and still having the audacity to ask for more things in this life and the hereafter. It was a day like no other, a day in which millions were saved from the Hellfire (by God’s leave). Interestingly, ʿArafah is located outside the boundaries of the sacred lands to which we would travel that night. It was as if we were being cleansed and purified before becoming worthy of entering these blessed lands again. Similar to how we would smarten our appearance, change our clothes and put on perfume before meeting any king or leader, Allāh wants us to purify our hearts before visiting His house for we are His guests. On leaving ʿArafah late that night, we re-entered the blessed lands, inshāAllāh purified, and travelled to Muzdalifah where we would be spending the night. Muzdalifah is derived from the Arabic zalafa which means “to come closer to”; i.e. we were coming closer to Allāh’s house now. The sunnah of this night is to rest and to glorify Allāh. Again, from the mercy of the Most Merciful due to the intensity of the day that was to follow. The night in Muzdalifah is a most humbling experience. Alongside millions of pilgrims from every corner of the globe, you sleep as one on the uneven plains beneath the open sky, no tents, no walls, no roofs. Here is does not matter whether you were a CEO of a multi-national company, a teacher or a street-cleaner, everyone sleeps in the same condition and experiences the same hardship. There was no distinction, all were equal before Allāh. 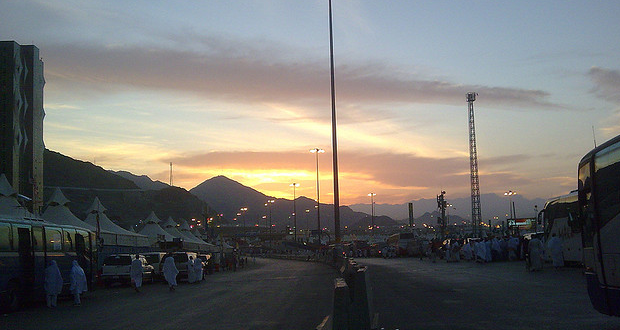 Exhausted by the day of ʿArafah, many pilgrims said they had never had a better night’s sleep. I recall waking around 4 am and feeling momentarily confused and disoriented as to where I was. I looked around me and the sight of an endless sea of shrouded bodies all asleep or stirring and looking equally confused, it was terrifying. It was a startling reminder of the Day of Resurrection when people would be raised from their graves, confused and distressed, asking who had woken them from their deep slumber: another wake-up call to the reality of this dunya. While one and a half billion Muslims celebrated Eid the next day, we set off on foot from Muzdalifa back to Mina for what would be an extremely busy day. We first began our march to the Jamarāt where we would follow in the footsteps of Ibrāhīm (ʿalayhi al-Salām) and stone the pillars, symbolising Iblīs. Although we were to only pelt the large pillar on this day, there are 3 pillars representing the three locations at which Shayṭān tried to tempt Ibrāhīm (ʿalayhi al-Salām) away from the commandment he had been given to sacrifice his son Ismāʿīl (ʿalayhi al-Salām). At each location, Ibrāhīm (ʿalayhi al-Salām) pelted the Shayṭān, displaying his enmity towards him and affirming his allegiance to Allāh. As we walked to the Jamarāt, I thought of the immense tawakul of this great father and son. Purely out of desire to please Allāh and fulfil His command, Ibrāhīm (ʿalayhi al-Salām) was willing to sacrifice his only son, a son who he had yearned for decades, a son who he had not seen for years after Allāh commanded him to leave him in the desert alone with his mother. Ismāʿīl (ʿalayhi al-Salām) too, only a child but knowing that the pleasure of Allāh was the greatest pleasure for which one should even sacrifice one’s life, fully complied with the command. Despite Shayṭān’s whispers, Ibrāhīm (ʿalayhi al-Salām) proceeded with his mission until Allāh sent him a lamb to slaughter instead. He had passed the test, again. And because he was willing to sacrifice his beloved for Allāh, Allāh took him as His beloved, and Ibrāhīm became His friend. He understood that there could be no obedience to creation which involved disobedience to the Creator, a lesson we should have all had in mind as we pelted the Jamarāt. The actual walk to the Jamarāt felt like a march to war, hundreds of thousands of pilgrims from every part of the world, all dressed in identical uniforms, all possessing the same weapons and all chanting the one slogan, the talbiyah – Labbayk Allāhumma Labbayk; all converging from every corner of Mina to the accursed enemy, ready to stone him. It was our opportunity to show our allegiance to the army of Allāh and demonstrate our enmity to Shayṭān. With the pelting done, we left to have our heads shaved. The significance of this is to look humble and to again demonstrate our equality before our Lord. This hair, which in our daily lives we fashion and display to exhibit our individuality, we were now sacrificing for Allāh. We returned to our tents and finally removed the iḥrām we had been wearing for several days. This was a great relief for me personally as the dust and dirt that it had picked up was causing me severe breathing difficulties. As I showered and proudly dressed myself in a clean thawb and applied some perfume, I became aware of the great blessing which Allāh has given us in providing us with more than one garment of clothing. Millions of our brothers and sisters do not have this luxury and spend weeks, months and even a lifetime in the same clothes. We spent the next three nights in Mina which I would count among the best days of my life. A city which consists of thousands upon thousands of identical tents, Mina epitomised the true essence of Islamic brotherhood. Although packed like sardines into tents the size of a mattress for you, your bag and half of your neighbour, the brotherhood I witnessed in these tents was like no other. We each had our entire dunya contained in one duffel bag. We were forced to rely on the food and drink given to us by our tour operators at the times they gave it to us. We all had to queue to use the same filthy toilets which doubled up as showers. Reduced to such simplicity and equality we were all humbled and, in such circumstances, one’s humanity emerges. Everyone seemed to be looking out for other brothers, sharing their provisions, attending to the ill, sacrificing their sleeping bags for their neighbour’s comfort, I could give numerous examples. It was so beautiful; so much peace and harmony, brought about by the fact that we were all undergoing the same hardship together with no claims of superiority. It was only when we spoke to each other that we learned about the man behind the iḥrām – doctors, lawyers, teachers, civil servants, Tesco cashiers – in a life of such simplicity, we lived as equals, we lived as one Ummah. For me, Ḥajj is the opportunity for one to experience a taste of what our oppressed brothers and sisters go through on a daily basis. Staying in the crowded Mina tents reminded me of the refugee camps in places like Afghanistan and Pakistan. Waiting on tiny buses stuck in a maze of other buses for five hours in what should have been five minute journeys brought to mind the plight of the Palestinians. As we were forced to go to the maktab to lodge or take our passports with every journey and wait there for hours or sit on the pavement in the late night waiting for another bus, I thought of our brothers and sisters in that blessed land who are prevented from going to work or school due to the endless Israeli checkpoints. Sleeping in Muzdalifah was the opportunity to share a night with the millions for whom a roof over their heads is a faraway dream. Finally, the march to and the pelting of the Jamarāt instils in the ḥujjāj the desire to unite and join the ranks of the mujāhidīn waging war against the enemies of Allāh in places such as Somalia, Iraq, Chechnya and Kashmir. It was a truly universal experience. In light of the above, it was very disappointing to note that neither the Khutba-e-Ḥajj nor the Jumʿah khutbahs I heard discussed the plight of the Ummah and instead constituted generic advice with specific warnings against extremism and terrorism. This is an opportunity to mobilise and empower the masses of hujjāj, to motivate them to return to their homelands with the zeal and passion for change and reform of their societies and not just themselves. This is the point where they have sacrificed all their time, money and energy to seek their purification and expressed their desires to change themselves. They yearn to return home as if they were newly born without any sins and with a fresh chance at a life of pleasing Allāh. If informed of the importance and virtues of jihād, they would no doubt pursue it without giving it a second thought. To fail to mention these issues is something which only pleases our enemies who are aware of how Ḥajj can reform the pilgrims. It is no secret that many countries such as China, Myanmar and Uzbekistan prohibit all but the elderly from performing Ḥajj for this reason alone. Uzbek pilgrims are also carefully selected by the government and then accompanied throughout by members of the Uzbek security services disguised as devout pilgrims whose job is to monitor the pilgrims’ activities and gather information. In Turkmenistan, President Saparmurat Niyazov personally approves the list of pilgrims for Ḥajj. All of the above countries limit the number of pilgrims far less than their quota allows. The junta in Myanmar annually warns the few hundred pilgrims from its land to stay away from any political activity while on Ḥajj. These oppressors are aware that Ḥajj has the potential to be the explosive catalyst that will awaken the Sleeping Giant and will do all that they can to limit the experience to a collection of meaningless rituals. It is up to Muslims to educate each other on the greater significance of this great act of ʿibādah so that on their return, they can live the Ḥajj every day of their lives. This is the real battle and the real test of our faith. . Previous: Tell Me Who This Man Is! Having just come back from Hajj, I can really relate to the wisdoms and lessons learnt from the whole experience as eloquently mentioned by the author. Do I smell a hint of treachery? Hudhaifah, you sound like a government agent – it’s defo something they would say! Inspiring words but not everything is about politics. Hajj is about spirituality.